Thibault Schwartz is a young architect based in Paris and London. 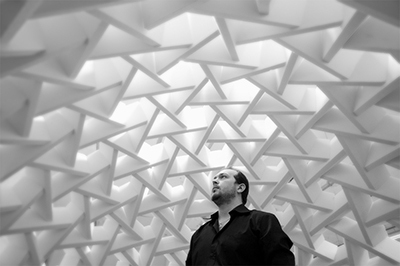 He explores the evolution of architectural design practices in relation to generative algorithms and automated fabrication processes. Working in close collaboration with EZCT Architecture & Design Research, he is currently developing several hardware and software tools for robot-assisted construction and design. The “HAL |Robot Programming & Control” plugin for multi-robot programming via Grasshopper is part of these tools. Paying particular attention to the development of industrial manufacturing strategies applied to architectural projects, he is attached to a systematic prototyping exercise aiming to complete and evaluate digital experiments. As a teacher, he has been sharing the knowledge gained from these experiments in international events such as Advances in Architectural Geometry and Rob|Arch, and in several European schools of architecture and design such as TU Wien (Wien), the Berlage Institute (Rotterdam), the Ecole Nationale Supérieure d’Architecture Paris-Malaquais (Paris), the Ecole Nationale Supérieure de Création Industrielle (Paris), the Institut für Experimentelle Architektur (Innsbruck), die Angewandte (Wien), and the UCL Bartlett School of Architecture (London) where he currently is co-tutor with Philippe Morel of the Research Cluster 5, and the Robot & Production Coordinator of the Graduate Architectural Design program. Since November 2013, he is a PhD candidate at the Geometry Structure Architecture laboratory of the ENSA Paris-Malaquais (Paris), under the direction of Robert Le Roy (Ecole des Ponts-ParisTech, ENSAPM) and Olivier Baverel (Ecole des Ponts-ParisTech, ENSAG). This undergoing research is focusing on the “architectural potential of Ultra-High Strength Fiber-Reinforced Concrete lightweight structures”, with a specific interest on the environmental impact and the industrial fabrication processes related to these structures.